the Atlantic Mutual Insurance Company, led a group of New York City marine insurance companies in forming a not-for-profit, benevolent purpose society to promote the safety of life at sea. This evolved into the American Bureau of Shipping which developed the procedure of rating the structural and mechanical fitness of ships called classification. The promotion of the safety of life and property through classification has remained the central focus of ABS ever since. While this focus is unchanged, the knowledge, experience and resources of ABS have grown. In recognition of this advancement, the activities of ABS have evolved from strictly ship classification into related areas. Today, ABS and its subsidiaries of the ABS Group of Companies, Inc. provide certification, inspection, analysis, quality assurance, and ship classification service to marine, offshore, government and industrial sectors on a worldwide basis. The first ABS rules, those for Building and Classing Wooden Vessels, were published in 1870. Since that time, ABS rules have kept pace with the developments in the shipbuilding industry, with Rules for Building and Classing Iron Vessels published in 1877; and Rules for Building and Classing Steel Vessels in 1890. These latter standards have been updated and published annually ever since. The first half of the 1940s was a time of unprecedented growth for ABS. From the start of World War II through 1945, a total of 5,171 Liberty Ships, Victory Ships, T-2 tankers and various other type vessels were built to ABS classification as part of the Maritime Commission's Wartime Shipbuilding Program. This set the stage for ABS's emergence as an international organization. Following the war, ABS representation expanded throughout the world, as the government sold hundreds of ABS class surplus vessels to allies who had lost a large portion of their fleets. Today, ABS has nearly 850 exclusive surveyors and engineers stationed in 168 locations around the world, on call 24- hours-a-day. The late 1950s and early 1960s marked a significant transition period for ABS and for the shipbuilding industry—a technological transition. Up until that time, the primary criterion by which a ship could be classed was by comparison with similar ships proven successful in service. However, advancements in marine design made it evident that a means for analyzing innovative structures was needed. ABS responded in 1965 by participating with the University of Arizona and Chevron Shipping Company in a research project to develop a finite element system of programs, known as DAISY, for a computeraided analysis of any type of vessel structure. By the early 1970s, computeraided finite element analysis enabled ABS to class a number of innovative ship types—large selfpropelled LNG carriers, pure container and barge carriers, very large crude carriers, floating industrial units, rigidly integrated tug-barge combinations, and mobile offshore drilling units. Also, with the innovations of the 1960s, there arose a need for classification standards for application to special purpose vessels whose unique structural or mechanical features were not comprehensively covered by the ABS rules for steel vessels. Therefore, ABS published guides covering the construction and classification of nuclear ships, underwater systems and vehicles and mobile drilling units. As the years went on, ABS special rules and guides have been published to fit the needs of the marine and offshore industry, and in 1987, its 125th year, ABS published 21 different guides, including the Guide for Building and Classing Offshore Racing Yachts, and 16 different rules. In 1970, ABS Worldwide Technical Services, Inc. (ABSTECH) was formed as a wholly owned subsidiary of ABS to provide certification, inspection, analysis and quality assurance services to the marine sector for functions above and beyond those traditionally performed and also to related nonclassification services in the industrial sector. In 1978, ABS commenced classification and certification services with site specific structures of various types including single point moorings, hydrocarbon production and processing structures, floating production storage offloading units, and steel and concrete caisson drilling units and concrete islands. As the 1970s moved on to the 1980s, ABS activity with all types of vessels continued to increase, but its work with the offshore sector grew the fastest. ABS had been involved with mobile offshore drilling units (MODUs) since their inception in the Gulf of Mexico some 25 years earlier. About two-thirds of the world's MODUs are ABS classed. Late in 1981 and early 1982, the U.S. Coast Guard signed a two-year Memorandum of Understanding with ABS under the terms which the Coast Guard agreed to accept ABS plan review and inspection of various hull and machinery items for construction of U.S.-flag vessels built to ABS class and USCG certification requirements. As extensions of this Memorandum in early 1982 the Coast Guard also agreed to accept ABS admeasurement and tonnage certification of their behalf. The 1980s saw the continued expansion of their services. ABS services encompassed such areas as marine hydrodynamics, seakeeping, stability, mooring analysis, finite element structural mechanics and structural dynamics, vibration and noise prediction and prevention, and fatigue analysis. In another area survey methods were developed by ABS during this time to replace traditional ones. Typical of this is the comprehensive preventive maintenance program based on condition monitoring using such techniques as vibration analysis, lubrication oil analysis, and other more sophisticated techniques to determine the operational conditions of a particular machinery item. During the same period, ABS also developed synchronized surveys in order to help owners time various classification surveys and those required by international marine safety conventions so that they would coincide to the maximum extent possible. Other survey procedures were offered such as underwater inspection, voyage surveys, and tailshaft monitoring in lieu of withdrawal. During this period, ABS developed its quality assurance system of programs for individual, batch, and mass produced products, as well as manufacturing processes. These services have become well accepted and by the beginning of 1986, almost 1,000 manufacturers were enrolled in the various ABS quality assurance and related programs. In 1983, a new division of ABSTECH, called ABS Boiler Marine and Insurance Company, was formed to carry out examinations of boilers, pressure vessels and pressure- related equipment according to ASME code. Additionally, that same year a second ABSTECH division, ABS Oil Testing Services, Inc., was formed to complete tests of bunker fuels and lubricating oils used in main onboard propulsion and machinery systems and power generation and industrial plants. To better fit everyday use of the ABS rules with computer technology, in 1985 ABS instituted the EAGLE system of computer programs. This system is available to shipyards, designers and other outside users as well as ABS and has great potential benefit to all by affording substantial time and cost saving by accelerating the ABS plan review process in addition to eliminating duplication of effort. 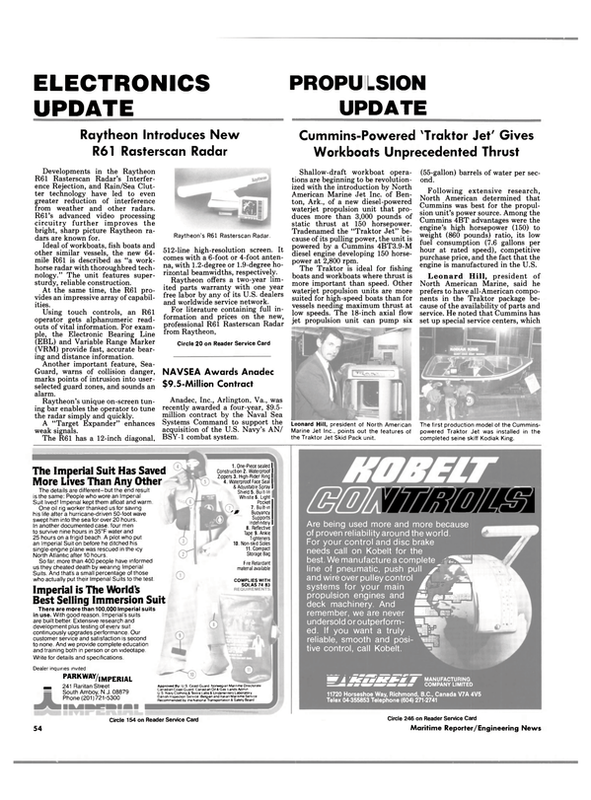 By the end of 1986, EAGLE contained several of the ABS rules and the aim is to include all of the computer programs for ABS rules in its vocabulary and also computer programs for a wide spectrum of related functions such as hull girder strength, ship hydrostatics, structural frame analysis and stability. The 125th year of ABS, celebrated last year, saw the enactment of an important new business approach. ABS intensified its activities in nonmarine and nonclassification work as well as concentrated on its basic classification business. For this purpose the ABS organization was reorganized into three groups— the American Bureau of Shipping, which will continue classification and statutory work; ABS Worldwide Technical Services, Inc.
(ABSTECH), which will continue and intensify marine and industrial advisory services; and ABS Government Services Business Unit (GSBU), which will provide nonclassification marine services to government agencies worldwide.